Welcome To The Valencia Trader! The ever-changing online magazine for English speakers in the region of Valencia Spain including events, things to do in Valencia, places to visit, Valencia property, flights to Valencia, Valencia car hire, football tickets and much more! Looking for a cheap flight to Valencia or flight to or from Valencia Airport, Murcia Airport or Alicante Airport? Try our Flights to Valencia page. Our Airports & Flights section (in Out & About) details cheap flights and airlines to Valencia airport, Murcia airport and Alicante airport. Includes links to airline websites! 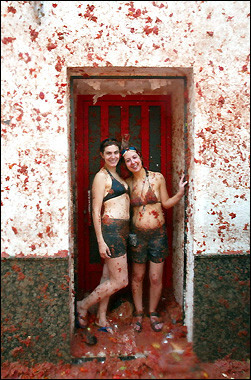 Don"t miss this The Spanish Tomato Fiesta of Buñol - La Tomatina! The 2009 Moto GP will be held in Valencia in November 2011. The dates for the Formula 1 Grand Prix of Europe are to be confirmed. The Benicassim Festival 2011 dates are 14-17 July 2011. It's time to start thinking about Fallas 2011 in Valencia. If you're planning your visit to the amazing Las Fallas then start now . Aqualandia in Benidorm offers a day for all the family at its waterpark. We've located some fantastic suppliers of fancy dress outfits and fancy dress masks - they appear to deliver to Valencia as well! A new business networking group is gathering momentum in Valencia. Fun for all the family with a new holiday park site for the UK. Flights and Cheap Flights to Murcia, Car Hire Murcia, Airport Parking Murcia. Malvarrosa and Arenas beaches are just minutes from the city centre and are easily accessible. The Reina Sofia Palace of the Arts is one of the worlds biggest spaces dedicated to scenic arts. The Lladró City of Porcelain allows organised visits to the world famous Lladró workshops just 10 minutes from Valencia city centre. Mundomar (Seaworld) in Benidorm is an attraction with marine animals and exotic birds. Bioparc opened in Valencia at the end of February 2008. French Fusion - An activity holiday in France awaits you! FOR SALE - 3 Bedroom village house€75,000. The hospitals in Valencia and Alicante. Well, these are the hospitals in the Valencia area, but also the ones in Alicante. You find all the websites, with the right information. Miss the shops in the UK? 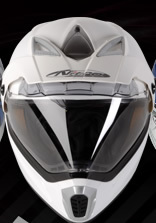 Nitro Racing hits Spain with this brand new website and business offering. Ryanair will commence Valencia - Portugal route in November. Horchata or Tiger nut milk is a refreshing and nutritious vegetable juice with a high starch, fat, sugar and vitamin content.